Another crash-related accident is hydraulic brake lines being pulled out. In fact, the lines can often cause accidents, so be sure to clamp them close to the fork and frame so they don’t tangle in the wheels or in passing shrubbery. As hydraulic hoses are fairly strong, the most likely damage you will cause is pulling the hose out of one of its fixing points – either the lever (sometimes called master cylinder) or the brake caliper. You may be able to fix this kind of damage so long as there is a sufficient length of undamaged line, there is sufficient fluid, and the part of the hose which attaches to the lever or caliper is screw-on rather than clamp-on. With a shortened hose length, steering may be compromised. It may even be necessary to slide the brake lever along the handlebar closer to the stem after the fix. First determine the kind of hose fittings (sometimes called “banjo” fittings) you have; screw-on or clamp-on. 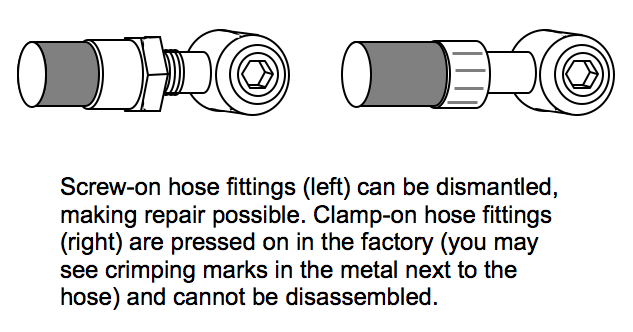 Clamp-on hose fittings are crimped on to the end of the hose in the factory. They have no visible threads or flat sections for a wrench to turn. You are out of luck – stop any further hydraulic fluid from leaking by pushing a twig into the broken ends of the hose, and ride out with just one brake. Make sure no more fluid leaks out. Push a twig into each broken end of the hose. Do not allow any fluid to touch your bike, especially the rotor and brake pads. It makes sense to remove the wheel and brake pads before continuing with the repair. Ensure that the remaining hydraulic hose line is long enough. Leaving the hose fitting on the lever or caliper to provide better leverage, unscrew the part of the hose fitting which is supposed to hold the hydraulic line in the banjo or lever. Retain all of the parts. You should have a cylindrical piece with the bolt pattern on it which you unscrewed, and inside that you should find a flat soft metal washer (called an “olive”). The olive may well prevent any torn piece of hose from coming out of the cylindrical piece – that’s its job. If the hose tore completely out from the fitting, then the olive may be still attached to the hose, or stuck inside the cylindrical piece. The end of the hose that was in the fitting should also have a barbed tube stuck inside it. Remove this barbed tube from inside the hose by making a lengthways cut through the hose. Cut the end of the hydraulic hose that you will be re-using. To make a clean, straight cut, place your knife perpendicular to the hose and tap it hard with a rock. Now thread the correct parts of the fitting back on to the hose. Start with the cylindrical bolt piece, making sure that its threads are facing the end of the hose (this piece has to thread back on to the rest of the banjo or lever). Now thread on the olive – you may have to bend it back into shape first. Without the olive, the hose will not stay in place. Now, insert the barbed tube inside the hydraulic hose end. Make sure it goes all the way in. This may take a couple of taps with a screwdriver handle or similar. The barbed piece should stop the olive from slipping over the end of the hose. Now, slide the cylindrical piece back towards the cut end of the hose, over the olive, and reattach it to the part of the hose fitting that is left on the brake lever or caliper (remove the twig you were using as a stopper first). As you screw the cylinder tighter, the olive will compress against the hydraulic line, holding it in place. Remember, you may have to remove the brake lever from the handlebars in order to reattach the shorter hose, and you may have to place the repaired lever closer to the center of the bars. Tip: Some brake fluid is dangerous to health. DOT3 and DOT4 fluid also strip paint. Treat brake fluid as you would any other dangerous chemical.